Nearly twelve pedestrians are struck and killed by cars every day in the United States, and Florida is one of the highest states in the nation for the most traffic-related pedestrian deaths. Florida’s temperate climate provides ideal year-round walking conditions for tourists, snow birds, and its ever increasing population. Combine this with the fact that Florida has the third largest population in the U.S., and it is not surprising that in 2016, there were over 8,000 accidents and 500 pedestrian fatalities in Florida. A pedestrian is anyone who is traveling by foot, which includes a person on a skateboard, roller skates, or in a wheelchair. Although pedestrian injuries can be caused by various accidents, serious injuries and fatalities result when motor vehicles are involved. When a pedestrian is seriously injured due to the negligence of an automobile operator, then the injured party can bring a claim against the driver. As in other personal injury cases, injured pedestrians may recover for their economic or non-economic damages. Economic damages include medical bills, property damage, and lost income, while non-economic damages include pain and suffering, loss of enjoyment of life, and mental anxiety. Nearly one quarter of traffic fatalities in Florida involve pedestrians. More than a quarter of pedestrian deaths due to automobile accidents occur between 6:00 and 9:00 p.m. Almost half of pedestrian deaths involve alcohol, and 34% of pedestrians who are killed had a blood alcohol level over .08%. 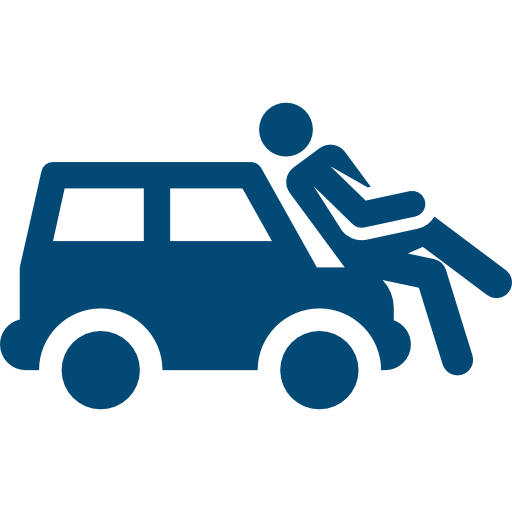 A hit and run is involved in 18% of pedestrian fatalities in Florida. The majority of pedestrian deaths occur in urban areas. Florida law has several important provisions regarding pedestrian safety. These laws apply to both walkers and drivers. All operators of motor vehicles have a duty of care to pedestrians on the roadway. When a driver injures a pedestrian through the lack of due care, then the driver may be liable for damages. Sidewalks: When a sidewalk is present, pedestrians must travel upon it and not walk on the roadway. However, if there are no sidewalks, then pedestrians should walk, with caution, on the left shoulder of the roadway. Crosswalks: Motor vehicles must give the right of way to pedestrians when they are on a marked crosswalk. Moreover, pedestrians must use a crosswalk to cross the street if it is present. It is far less likely that a person will be struck by a car if using a crosswalk than if the person crosses the road at an unmarked point. Pedestrians must also follow all traffic indicators and only enter a crosswalk when the signal permits. Failure to follow these rules is a traffic infraction and is punishable by a fine. No Crosswalk: When a pedestrian must cross at an area that does not have a crosswalk, Florida law requires that the pedestrian yield the right-of-way to all vehicles upon the roadway. Drivers must still take proper precautions to avoid injuring pedestrians, and cannot ignore pedestrians crossing the road if they are not in a crosswalk. Our law firm serves all of the cities in the Palm Beach County area, we are ready to handle your pedestrian accident case. We will file all the claims for you. We know that as a result of a pedestrian accident a person can suffer severe injuries, medical and rehabilitative expenses, physical and mental pain and suffering, loss of income, and other expenses. Shannon J. Sagan will fight for your case and will get you the compensation you deserve. Let’s get started!